On my first evening in Singapore, I met up with a few friends that I haven’t seen in years. I chose a place close to The Scarlet so I could walk over to the restaurant. Thanks to Chubby Hubby who twittered back several recommendations for good restaurants nearby.) Out of the four or five from his list, I decided to try the one that recently opened and specialized in Peranakan cooking, something I have never tried. Candlenut Kitchen is a tiny restaurant at the far end of Neil Road. The long room has about a dozen tables and is a simple space decorated with dark wood tables and chairs and a single frame of two kebaya-looking tops. I arrived first for our 7:30 booking and sat at the only table with a reserved sign on it. There were only two tables occupied, mostly with couples having a hard time deciding what to order from the menu. Ed, a friend from London days, and his wife arrived a few minutes later followed by Jenny whom I met in Cannes during the film festival in 2003. As soon as they had all settled into their seats, we all had a long, hard look at the menu and decided to all order something different so we could taste each other’s food. 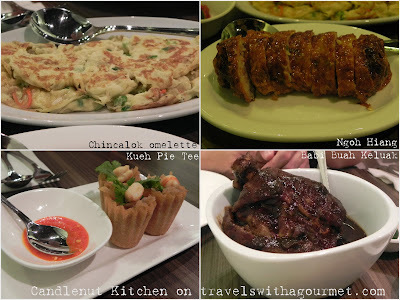 We started out with the two appetizers, the traditional Kueh Pie Tee – vegetables, shrimp and herbs in a crispy cupcake-shaped spring-roll container and the Chincalok omelet. Then the rest of our dinner started to come out of the kitchen one plate after another – the Ngoh Hiang, another traditional dish similar to a meat loaf but covered in bean curd skin, the Babi Buah Keluak – pork hock simmered in a spice-infused grave until the chunky, fatty pieces almost fall off the bone, Cap Cae – a vegetable stir-fry, fried fish fillet topped with extra-spicy sambal and the Sambal Petai prawns which were prawns stir-fried in a chili-based sauce. All our dishes were served with “all-you-can-eat” steamed white rice. It sounds like a lot but the portions are smallish so we managed to eat most of what we ordered and still had space or dessert. We ordered three to share – the Chendol cream which was a Pannacotta version of the traditional Pandan-flavored cream dessert, the mango soup which was mango ice cream, tapioca pearls and chilled mango soup and finally, the Sago Melaka – another traditional Peranakan dessert of tapioca in palm sugar syrup. The three desserts disappeared quickly and we ordered another Sago Melaka to share to finish off our dinner and our evening of catching up. My first experience with Singapore’s Nyonya or Peranakan cuisine, a combination created from Chinese and Malay influences, was a success and from my friend’s comments, they thought the same as well. Candlenut Kitchen is definitely going on my Singapore restaurant list and for the prices they charge, it could become a Singapore habit.